Though the season here is done and I suspect our South Florida roosts are also done, up in North Carolina things are heating up. 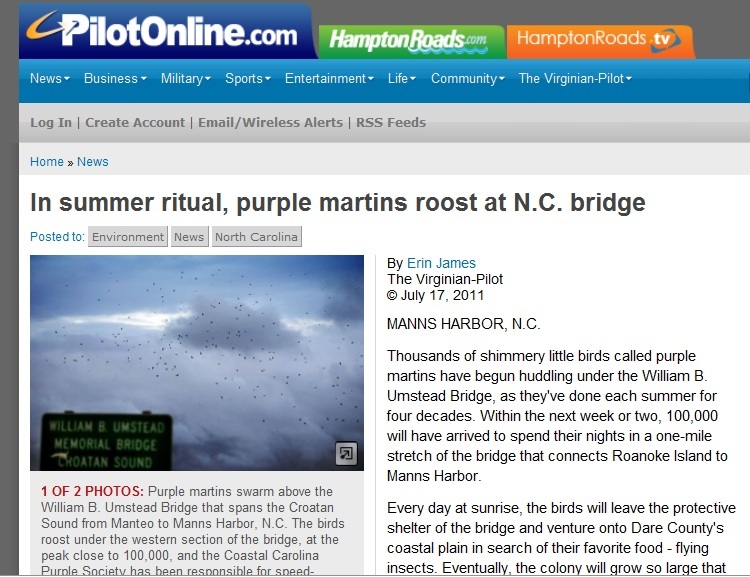 The William B. Umstead Bridge in Manns Harbor plays host to a huge purple martin premigratory roost. The Manns Harbor roost is swarming with martins at dusk. For about another month or two these birds will be roosting under the bridge in such large numbers that warning lights were installed to slow traffic as hundreds of birds were being struck and killed by cars at dawn and dusk. As years past the Coastal Carolina Purple Martin Society (CCPMS) will be having boat tours and for $30 a person you will be witness to a spectacle of nature. You can read about the tour on a previous blog post from last year or go straight to their website to contact for reservations at Purple Martin Roost Boat Tour Information. Know of a roost near you? Make sure you visit it before they are gone. 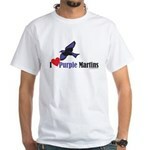 2011 Purple Martin Season is DONE! By any account, my season is over here in South Florida and all martins have left. Not that my birds need bad weather to end their party, migratory birds know when it is time to go based on known factors such as the length of day and for some types of birds, even star patterns. There is nothing to be done for purple martins (or any other migratory bird-for that matter) that linger on. Some folks will tell you to lower or remove housing, but don’t bother. Just like the old wives tales that persist that tell hummingbird aficionados to remove hummingbird feeders to push hummers to migrate, nothing needs to be done.